US$ 2225 / person ? 1 Arrival to Paro Arrival to Paro. Visit National museum of Bhutan and Paro dzong, castle where Bernardo Bertolucci’s Little Buddha film was shot. Explore lively little town. Sightseeing subject to arrival time. 2 Paro Drive to castle-ruins of Drukyel dzong, from where you can see the top of holy Jomolhari mountain. Explore the calm Kyichu lhakhang which also pins down giant demoness body. Climb to Taktsang gomba (Tiger’s Nest), is the highlight of the tour. While the hike seems to be hard, it’s very rewarding. If you don’t feel so strong, you can climb just halfway to cafeteria with nice view of the place. You can consider hiking in the morning or early afternoon depending on weather, your fitness and preferences. 3 Paro – Jakar flight Flight to Bumthang is extraordinary experience. You will see many of the seven and six thousand meters high mountains on the border with Tibet, including Gangkhar Punesum which counts as the highest mountain never summited by men. Arrive to Jakar. Visit small brewery to taste local Red Panda beer (subject to brewery operation schedule). Explore the rustic small town. Day's program subject to domestic flight timing. 4 Jakar, excursion to Tang valley Drive to Tang valley and hike to Ugyen choling palace which hosts wonderful private museum with carefully selected artifacts used in medieval Bhutan for various activities. If you feel strong, you can climb to Kundzongdrak gomba overlooking valley from sheer cliff. Otherwise you can visit nunnery, hosting the Buddhist nuns of all ages. You should not miss so called “Burning lake” Membartso where the treasure of scriptures hidden here by magician-saint Guru Rimpoche were discovered by saint Pema Lingpa. 5 Jakar Visit of sleepy castle Jakar dzong and old Jambay lhakhang temple, which pins down the leg of giant demoness. Walk to Kurjey lhakhang temple complex. After exploring the place, enjoy the picnic lunch on beautiful riverside. Finally continue walk to Tamshing Gompa, the temple where you can wipe your sins by carrying the chain-bar smithed by 15th century blackmisth-saint Pema Lingpa. Then marvel over the wonderful paintings inside the renovated Kenchosum Lhakhang, the seat of the mind and speech reincarnation of Pema Lingpa. Rest of the day in leisure or other program suggested by guide. 6 Jakar – Gangtey Early morning drive to Trongsa over Yotong-la pass (3550m). Visit dzong, the castle from which the royal dynasty of Bhutan has risen. Also explore intricate museum in watchtower Ta Dzong hosts number of interesting artifacts related to royal dynasty, history of Bhutan and many religious statues and temples. Then we will start drive to Pele-la pass (3540m), ancient border between western and eastern Bhutan. On the way we will stop at Chendebji stupa, which was modeled after Boudhanath stupa in Kathmandu and is just much smaller size. Reaching Gangtey by the evening. You might like to try the hot stone bath, traditional Bhutanese treat (on extra payment, need to be ordered in the morning). 7 Gangtey – Wangdue In the morning drive to Gangtey gompa located at the top of the hill with commanding view of the valley. The historically important monastery belongs to Niyngma school of Buddhism. Walk through village with lots of interesting handicraft shop. From here you will start 2.5 hour walk, one of the most beautiful and easy hikes in Bhutan. You will go around the buckwheat and potato fields to the mixed pine forest with trees decorated with old men's beard lichen and finally you will reach to a view of marshland. Here, in the late autumn and winter, rare Black Neck Cranes can be seen. Descend to valley bottom and visit Kewa lhakhang, the newly established monastery on the place where the demoness was subdued in the past. Drive to local farmhouse to taste local kitchen and other delicacies like the salty suja tea and ara spirit. Then visit to Black Neck Crane center. The birds comes for roosting to the valley in great numbers form November to the end of February. See interesting documentary on bird conservation efforts and related exposition. Drive to Wangdue, reaching in the evening. 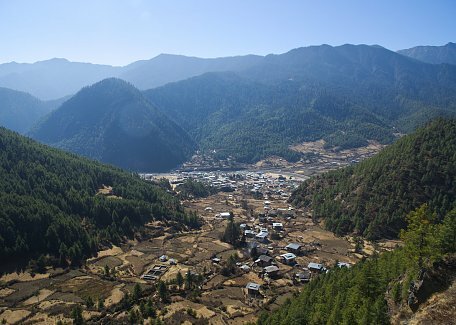 8 Wangdue – Thimphu Early morning hike to Khamsum Yulley Namgyal Chorten with wonderful view of the valley and it‘s terraced paddy fields. Visit of Punakha dzong, which counts as the most intricately decorated castle in the kingdom. Short walk to Chhimmy lhakhang temple, devoted to 15th century saint Drukpa Kuenley, know as “Divine madman”, who did taught Buddhism by singing, drinking and rampant sexual behavior. Drive to Dochu-la pass where you can see nice mountain panorama in clear weather and stupa made of 108 smaller stupas. Reach Thimphu by evening. 9 Thimphu Early morning drive to Buddha Dordenma, the gigantic statue of Buddha overlooking the valley and walk to striking city viewpoint. See Memorial Chorten, always busy with devotees. Walk in Norzin lam street and see the traffic police signaling in junctions. Thimphu is only capital in the world without the traffic lights. Finish walk at handicraft market where many interesting Bhutanese souvenirs can be seen and bought for reasonable price. Visit hand paper factory a Thangkha painting centre, where young artists learns the skills of their forefathers. After that Changankha lhakhang, the oldest place of worship in the valley. Then get to Clocktower square and enjoy free time to explore the town on your own. Early evening visit of Tashicho dzong, the castle, which serves as seat of the king and government. 10 Thimphu – Haa Morning leisurely revisit the town. Check the hand paper factory for traditional craft and peek at Changlimithang stadium for possible archery match. Visit to Simtokha dzong, the first castle-monastery built by Bhutan's unifier Shabdrung Nawang Namgyel in 17th century. Then drive to Haa valley using scenic road from Chuzom. On the way we can shortly stop to see 15th century Dobji Dzong castle monastery, which is said to be first building of this design ever built in Bhutan. Accommodation in local farmhouse and visit to main village temple, Lhakhang Karpo (white temple) dedicated to local deity. Overnight will be spent in local farmhouse as a guest of local family, with trying local delicacies like salty butter tea, and ara spirit. Accommodation facilities are rudimentary but experience is worth of it. Optionally you can spend night in hotel. Evening option to try hot stone bath, traditional Bhutanese treat. 11 Haa – Paro In the morning visit to main village temple, Lhakhang Karpo (white temple) dedicated to local deity. Then drive to Katsho village and undertake short hike up to Juneydrak hermitage. This small temple perched to the rock cliff is considered to be “second Tiger’s Nest”. The last section of climb to this temple is very steep and you might need a support of rope which is fixed here. Place is inhabited by two welcoming hermits who will take you around. Then drive to Chele-la pass and picnic lunch there. In clear weather you might see Kanchenjunga mountain to the west and holy Jomolhari peak to the north. Descend by car to Paro. If time permits, visit also Dzongdrakha lhakhang, the temple built below the rock cliffs with great view of rice fields of Bondey village. The beauty of this temple, rarely visited by travelers, is only matched by the Tiger's Nest.